Such a great way to use leftover corned beef. Dovetailing tip: Use the leftover sliced corned beef brisket from Meal 1. Preheat the oven to 350°F. As it heats, place a skillet on medium-high heat, getting it warm. Add the olive oil and sear the cabbage wedges on both sides (about 1 minute each). Place a cooling rack on top of a baking sheet. Place the cabbage wedges on the cooling rack, then pour the Guinness through the holes of the cooling rack so it fills the bottom of the baking sheet. Carefully place the baking sheet in the oven and cook cabbage for about 20-22 minutes, or until the edges have browned a bit. 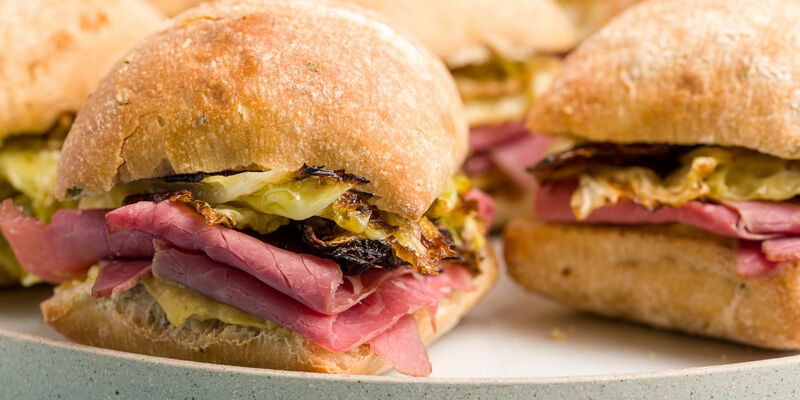 Assemble the sandwiches: Slice the ciabatta rolls in half. Spread dijon mustard on one side, top with slices of corned beef and cabbage. Serve.